When imagining companies who use business analytics, people often envision city offices filled with men in fancy suits trying to develop a killer business strategy. Though BI does help organizations be incredibly smart about their finances, there is often a misconception as to what types of organizations can benefit most from BI. When imagining companies who use business analytics, people often envision city offices filled with men in fancy suits trying to develop a killer business strategy. Though BI does help organizations be incredibly smart about their finances, there is often a misconception as to what types of organizations can benefit most from BI. That is, almost any organization can benefit tremendously from business intelligence and analytics, and they are all starting to do so–from healthcare, green energy, manufacturing, security, finance, as well as all the internal departments inside those organizations such as marketing, sales, and finance departments. Healthcare organizations are a prime example of an industry taking part in the data revolution by using innovative BI technology to transform their organization’s strategy and efficiency levels. Healthcare is an industry that accumulates a lot of data, even BIG data, as data streams from electronic health records, online interactions, doctor reports, insurance claims, phones and more–and it growing exponentially. Collecting all this data is often the more simple step of BI. But making sense of that data, or even better, drawing insights from that data is more complicated. Which is why organizations are turning to business intelligence tools to help them consolidate, visualize, and analyze this data. Today, healthcare providers are looking at their data differently, realizing business intelligence analytics can provide them with the ability to improve quality of care, increase financial and operational efficiency, and automate regulatory requirements. Even Google Ventures invested in a big data health startup that promises to herd incredibly big data–all cancer treatment records– and offer practitioners a clearer view of patients needs hoping to gain an invaluable edge on a cure for cancer. Not only do companies save money from more efficient use of time, resources, and information, but with neatly organized historical data at the fingertips of innovators, new research is easier to conduct. Healthcare organizational data can be used for anything from service line profitability and claims management, to surgical analytics and innovative research. Business intelligence analytics allow healthcare organizations to easily collect data that is infamously large in size or located in many different places, and create a single repository of information–or as many call it, the single version of truth. Creating a repository of all their data in a single place is key for harvesting accurate insights, as all information is taken into account together. By joining multiple datasets, healthcare organizations can ensure the consistency of critical assets such as master patient indexes, physician masters, diagnosis and procedure codes. Understanding how BI can help healthcare providers during the introduction of the Affordable Care Act, or Obamacare, is a perfect way to see the scope of business analytics in healthcare. When Obamacare came into act, there was a greater focus placed on the quality of care rather than the volume of patients treated. Healthcare providers faced the new and pressing issue of the Hospital Readmission Reduction Program that imposed significant penalties on hospitals who readmit patients within 30 days of discharge. Healthcare providers can easily pinpoint patient costs across various medical institutions in the country by analyzing data of locations of hospitals and information on average cost to care for a patient in a BI tool. 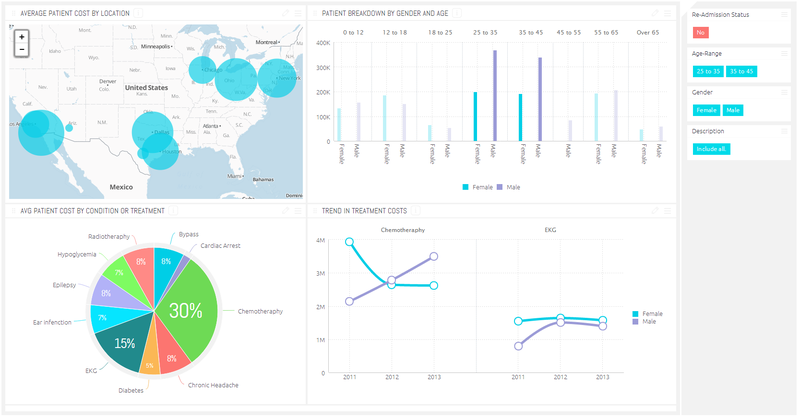 Using smart data visualizations, such as interactive mapping, a BI dashboard can provide one view of all locations with a higher average cost. Using demographics data such as age range, gender, average cost for care, it’s easy to identify patients who are most likely to be readmitted. BI tools allow users to filter data in a dashboard to drill down on the number of patients and their costs, causing insights to pop out. For example, male patients between the ages of 24-45 have spikes in cost in a certain period of time or location–which can be explored further to develop even more sophisticated insights. Filtering a database by diagnosis and total patient cost in a dashboard or report can reveal the most costly conditions to treat by highlighting, for example, chemotherapy and EKGs as the top expenses in treatments. Adding a time element to a dashboard shows monthly, quarterly, or annual trends. Not only does analyzing these three issues help healthcare organizations prepare for Obamacare, but it also allows them to collect useful insights to assess current performance for readmittance, identify areas of concern and opportunities to improve efficiencies. As people understand the impact that big data and business intelligence analytics have on the future of the healthcare industry, many healthcare CEOs want to know how their organizations can use these tools. In a PwC study, 95% of healthcare CEOs said they were exploring better ways to harness more information about pain points in their industries to better predict what they can do in the future to gain a competitive edge. Analyzing data using shareable, interactive dashboards and reports gives healthcare teams an accurate perspective about all company operations and establish a strategic oversight. When Will Medicare Part E Transform Healthcare?